Note in 2009: The following article was updated April 2003 and originally presented at our old geocities-page, which has been closed now. I made a new page and present it now here. Some dead links were killed and the nasty background was deleted, the other parts are left without change. The presented order was changed to a picture. Our own perception of this problem is - more or less - at least similar to that of 2003 (but a little more developed). The 11 Major Arcana of the Cary Yale deck can be seen in Stuart Kaplan, Tarot Encyclopedia I + II. As demonstrated at another page, there is a realistic possibility, that the Pierpont-Morgan-Bergamo deck originally was a 5x14 deck with totally 70 cards including 14 socalled trionfi, which later became characteristical for the socalled Tarocchi and the base for the modern game of Tarot. Also there is the realistic possibility, that at the time of production of this 70 cards (1450 - 1466) no other deck did possess the nowadays common game structure with 40 pip cards, 16 court cards and 22 trump cards. Under this viewing point one could examine the fragments of the Cary Yale deck, which is considered to be constructed under the reign of Filippo Visconti (although occasionally one meets the viewing point, that it was done later than 1466) and build a theory, how this deck was originally constructed. Inside the Major Arcana group appear the motives of theological virtues, that is Hope, Faith, and Love (Spes, Fides and Caritas), which are known in Minchiate decks, but not from the standard tarot patterns. The circumstances give the sign, that this deck is rather special inside the known documents of early playing card history and should be treated with great carefulness. Final conclusions about the state of the original deck are not possible, but it is great fun to jump into this riddle: What was the idea of Filippo Visconti in this deck? Is it possible to build a theory of reconstruction without any inner contradictions? It is a logical idea, that, when it was the mode of this time to construct decks with a 5x14-structure, that this deck with its unusual 16 cards per suit had a structure of 5x16 and therefore one should consider the total sum of 16 Major Arcana or Trionfi (the expression Major Arcana didn't exist at this time, so perhaps one should prefer the term "Trionfi"). 5 cards are unknown (if one assumes a 5x16-structure). What is known about Filippo Visconti and what can be assumed? 1. It is known, that he influenced personally the outfit of the Marziano-Michelino-Visconti deck, which had the theme of 16 gods. So probably he also influenced the outfit of the Cary-Yale deck. 2. It is known, that he loved the "16". He ordered the deck with the 16 gods and he had 4 books about Geomantia in his library, Geomantia being based upon 16 binary figures. And he had 16 Minor Arcana instead of 14 for each suit in the Cary Yale deck. 3. It is known, that he loved chess. In 1427 he builded a chessclub at his court and in 1429 it was visited by a Master player, who impressed by playing blind chess. In his library he had various chess-books, under these also the book of James da Cessole Liber de Moribus Hominum et Officiis Nobilium, in which the author makes a comparison between chessmen and social characters. I've read, that in some of the old manuscripts are paintings, "which in some cases are strictly reminiscent of triumphal cards". It should be known, that chess is played with 16 white figures against 16 black figures. When we compare this list with the above list with "11 known trumps", we find, that Love and Death are both already there. If we assume, that a "female on a chariot" might present in the mind of Filippo Visconti the moon goddess Diana (compare the moon-picture in the Mantegna-Tarocchi) and that Diana was the representative of Chastity (cause Artemis, the older Greek version of Diana, had promised to Zeus never to marry), then we've a 3rd figure. If we assume, that this 11th strange card, by some believed to be "World", was in the mind of Filippo Visconti a representation of Fama (the icononographical sign of Fama is the trumpet - and this card shows a trumpet), then we have a fourth element. Perhaps, if we assume, that the Angel of the last Judgment could be used as representative of Eternity, then we've a fifth (the "normal" Eternity trionfi used Jesus instead of an angel). With that as a background we've a suspicion, that Filippo was reflecting Petrarca's poem "Trionfi" in his game. However, Petrarcas poem knows only 6 places, and in the game are 16 places. However, Time is missing in the group of the 11 known cards. 5. It can be assumed, that Filippo felt a certain relationship with Boethius, who once had been the "prisoner of Pavia", before being executed by Theoderich. Boethius wrote in prison (ca. 523) De Consolatione Philosophiae, a book, in which the "good" allegory of Philosophia has as its opponent the "bad" allegory of Fortuna. It is known that Filippo also was in the year 1412 "prisoner in Pavia", when the condottieri Ficino Cane took for a short time the power in the dukedom of Milano. Saved by the sudden and unexspected death of Ficino, Filippo was forced by Ficino on the death bed to marry Beatrice de Tender, Ficino's widow, nearly double as old as Filippo himself. The unpleasant marriage ended 6 years later, when Filippo accused Beatrice, who was executed together with her assigned "lover" Michael Ourumbello. Probably due to this personal drama together with an emotional break in his childhood in a murderous and a little incestious family Filippo started to retire from public life around 1421, becoming a "strange man" until his death in 1447, always good for a militaric conflict in upper Italy in a series of wars. We do know, that in the Brera-Brambilla deck, which is considered to be older than the Cary-Yale deck, a card "Fortuna" existed. A Fortuna inside a card play (which eventually was made for Filippo, but not invented by him) might have founded the wish in Filippo to answer to that "bad" Fortuna-game with his Cary Yale action in a fashion, as it Boethius did. Boethius did involve virtues. 4 virtues could be found in the group "11 known trumps", but generally there are 7 virtues, beside the 3 theological virtues there are in the world of medieval systems the 4 cardinal virtues Temperantia, Fortitudo, Prudentia and Iustitia. 6. Also we know, that Filippo was very fond of astrology. And that he had many books about astrology. But there is not much of the planets (beside Diana perhaps for the Chariot, beside Venus for the Lovers) and there is nearly nothing of the zodiacal signs in this deck. So better we forget about astrology, when interpreting the deck. 7 Virtues - that must be the 8 pawns, but there are only seven virtues. One card is left in the pool: Love. 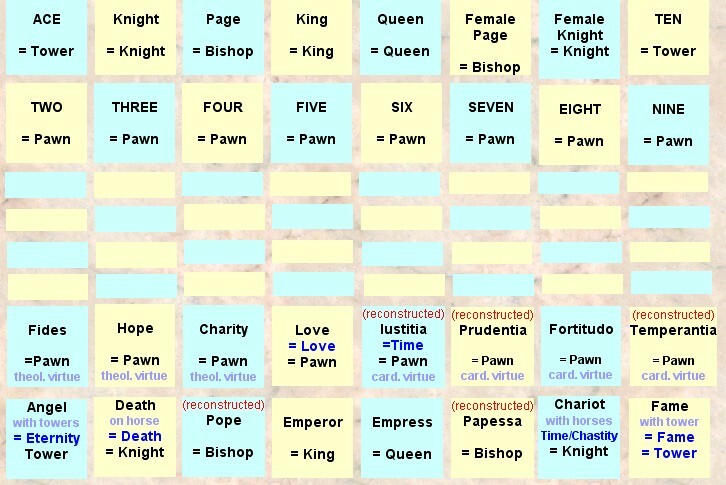 If I do follow the chessgame-imagination, than this card Love must be the 8th pawn on the side of the 7 virtues. There is no better place than the king's pawn; if I play white in chess, then there are 3 pawns to the right of the king - this should be the theological virtues, and 4 pawns to the left, this should be the cardinal virtues. Well, then I feel satisfied, and look at the board with my cards again. And looking at them, I do feel, it is right .... but that that is not all, there is another mystery. The towers at Angel and Fama, that is only additional framework and the horse for the death, that is not the only way to paint death. Filippo Visconti just mixed these symbols inside the game to make in a rather subtile way two different readings possible. He didn't want only to present chess in his play, but also wants to do something with Petrarca's Trionfi. There is no real place for Father Time ...... Why? It is known, that Filippo Visconti had crippled feet, in his age he had difficulties to walk. Father Time, the 5th chapter in Petrarcas Trionfi - a very old man - has to use crutches, as old as he is (common iconography). Do you think, that Filippo Visconti would have fun with card playing, when the playing card motives remembered him to something, which made him bad feelings? Some card researchers believe, that Filippo Visconti presented the game to Francesco Sforza and to his natural daughter Bianca Maria at their marriage in october 1441. Well, let's assume, that is correct. Then there should be some symbols of Love somewhere, naturally. One symbol we see on the Love-card, that's obvious. Another symbol we can see at the Chastity/Chariot-card in the Cary-Yale-deck: a courting knight is with the young lady on the chariot (that might be a symbol of love). A similar courting knight on a horse is on the Iustitia-card in the Pierpont-Morgan-Bergamo deck. Although there are great differences between these both decks (one cannot with security conclude from one deck to the other), perhaps it is allowed to imagine, that the same courting knight is on the Iustitia-card. Then .... under the condition, that this deck is really thought out for a marriage, Filippo Visconti might have replaced the unpleasant Father Time with difficulties to walk with another, nicer, symbol of time (the courting knight, which becomes a son-in-law and later will get the kingdom, in this case the dukedom). The 5x16-structure is a plausible assertion, as the later Bembo-Tarocchi in its originalform probably was a 5x14 -deck. There is no problem to associate the 16 Suits-cards of the Cary-Yale deck with the figures of a chess-game (see above). Much more troublesome is the question about the 16 Trionfi (this solution took me 13 years after exploring the 5x14-structure of the Bembo-Tarocchi), although I directly suspected a Petrarca-reflection and a long time ago I realised, that a chess-game should be inside (I never considered the towers on Fama and Angel). Probably I tried 100 or more different solutions. At the moment I feel a little stupid, that it took such a long time. Most arguments, which speak of the Cary-Yale deck as a marriage present, do relate to heraldic devices on the cards. Perhaps the strange card - by some interpreted as World, here interpreted as Fama - shows a sign, that eventually fixes the date: Above at the picture is Fama with crown and trumpet, at the lower half in the background city walls, houses and small towers, and ships, in front a knight on a white horse at a sea with boat and two men in it and a fisher is nearby. Relatively short before the marriage 1441, in November 1339, near the Gardasee Francesco Sforza had a battle with the men of Piccinino, another famous condottieri, who was in the service of Filippo. Piccinino could save himself into a castle, but 5000 ducatos were set out for his head and the castle was not so strong, that it could resist the enemy a long time. In the night Piccinino, who was a small man, was carried in a sack by a rather big German mercenary out of the zone of danger right across the former battlefield. The impressive German, hiding as a normal plunderer, picking up a few things here and there, wasn't hindered by anybody and nobody asked stupid questions. Finally they found a fisherman, who helped to cross the lake with a boat, reaching quickly his allies. Only one day after his defeat he stand at the city walls of Verona, which was captured the next morning for the Milanese (Sforza, taken totally by surprize, fought at that time for Venezia). It might be, that the scene of this happy accident (happy for Filippo, not for Sforza) was with great satisfaction painted on this wonderful card, just to remember this new son-in-law, that he was not always successful. It is known, that the trouble between Francesco Sforza and Filippo Visconti didn't stop with the marriage. But a second possibility is, that the Cary-Yale were not done 1441, but 1428 .... long before the scene between Sforza and Piccinino took place.